Sergio said that my best friend Bruno’s hat was weird. When I told him to stop, he called me a weirdo! If I had kept playing with Bruno, Sergio would have kept teasing me, too. But now I miss my friend terribly. What should I do? Told from the point of view of Bruno’s best friend, Peter, this insightful children’s book explores bullying—especially the choices children face in defending others who are bullied. Readers will see Peter’s struggle to overcome his own fear of being bullied as he learns how to help a friend. 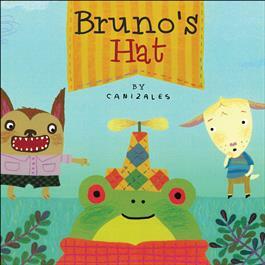 Bruno’s Hat features a variety of animal characters and colorful, lively illustrations. The book also includes a downloadable guide to help children, parents, and educators navigate the challenges of childhood bullying. The in-depth guide, available at www.flyawaybooks.com/resources, features various questions and activities for children.